This is Vikki Wright, an awesome American YWAMer working in the north of Uganda with her British husband and three kids. We first got to know Vikki and John through Tim's visits to their rural YWAM campus to teach on Discipleship Training Schools. It took us a while to realize that she has a love of writing, and a little longer to draw her into YWAM communication through the writing of stories from her region. Back in May this year, Vikki joined us for CRIT and her desire to incorporate communication into her ministry in a greater way began to take form. This week, as we met at the East Africa regional staff conference, it became clear that Vikki really carries the vision for developing communication more effectively in the region. In addition to that, she is a respected part of her base leadership team and well-known to the regional leaders, which makes it easier for her than for others to dialogue with the leaders on communication issues. 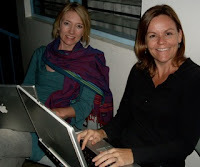 With the blessing of the leaders, Vikki has expressed a willingness to be the coordinator for AfriCom East, which she will do with help from Sandra Merriman who is geographically closer to the group of communicators located in Jinja, Uganda. That group is also being ably facilitated by Agnes, one of the graduates of our 2009 School of Field Journalism. Together these women will make a great team as we keep moving towards the goal of building more effective communication to, from and around East Africa. Welcome to the team!